Where is Kazakhstan on the world map? 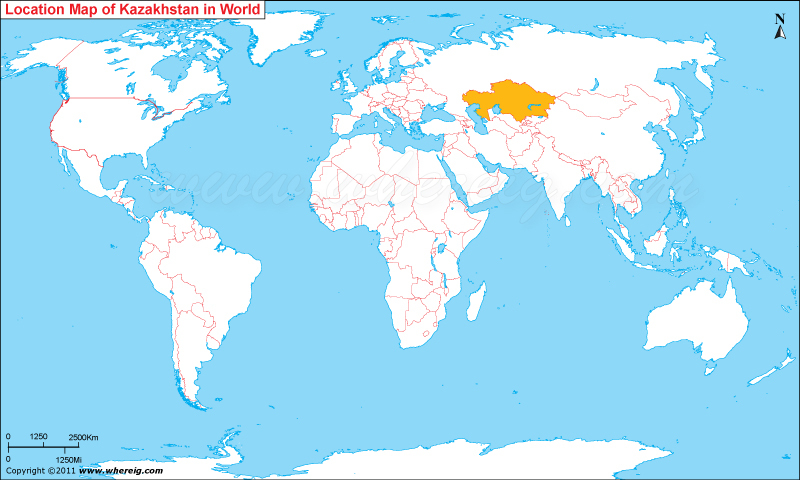 Kazakhstan is a Central Asian country; it has very large area and hence it is ranked only ninth in the world. It is world�s largest landlocked country. Kazakhstan shares its international boundaries with Russia in the north, China in the east, and Kyrgyzstan, Uzbekistan, and Turkmenistan in the south east, south and south west respectively. Besides, it also shares its coastal boundary with Caspian Sea in the west and south west. Along with vast size, the geographical features of Kazakhstan are � diversified terrain ranging from flatlands, steppes, taigas, rock-canyons, hills, deltas, and snow-capped mountains to deserts. The climate of Kazakhstan is of continental type, with warm summers and colder winters. However, precipitation varies between arid and semi-arid. From past to modern, the territory of Kazakhstan has been colonized by nomadic tribes. Kazakhs are the largest group; though, Kazakhstan is ethnically and culturally very much diverse. The government type of Kazakhstan is officially a presidential republic with flavor of strong authoritarian characteristics. Interestingly, Kazakhstan permits freedom of choosing religion; hence, many different beliefs are present in the country. Islam is the largest religion and Christianity is the faith of the most of the remaining people in the country. The Kazakh is the state language; but Russian is also officially used as an "equal" language.